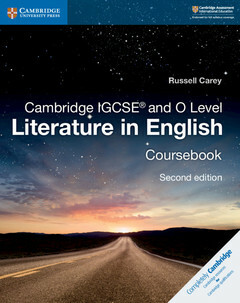 This updated resource provides full support for the Cambridge IGCSE®, IGCSE (9-1) and O Level Literature in English syllabuses (0475 / 0992 / 2010) as well as IGCSE World Literature (0408). Analyse how Carol Ann Duffy uses structure to convey meaning in 'Row', explore Anita Desai's first-person narratives and engage with characters in Tennessee Williams' play The Glass Menagerie. This coursebook encourages an enjoyment of literature while helping students write critical essays. It contains poetry, prose and drama from around the world to appeal to international students aged 14?16. The book takes an active approach to learning and stresses the importance of developing informed personal responses based on close textual study. Indicative answers to coursebook questions are in the teacher's resource and further practice is available in the workbook. Part 1. Introduction; Part 2. Building your skills: Poetry; Part 3. Building your skills: Prose; Part 4. Building your skills: Drama; Part 5. Consolidating your writing skills; Part 6. Preparing for assessment; Glossary; Acknowledgements.